Throughout the movie Gremlins we hear a corny disc jockey named Rockin’ Ricky Rialto. At first he’s just ambient noise playing on people’s radios, but as the film progresses and the town of Kingston Falls is besieged by little green monsters, the DJ’s broadcasts become more sporadic and panicked. Though we never see Ricky or his studio, these intermittent audio accounts painted a vivid picture in my eight-year-old mind; they helped broaden the scope of the movie in ways that I wouldn’t appreciate until years later. I was reminded of Gremlins while watching Corbin Bernsen’s surprisingly good new zombie movie, Dead Air. I’ll be up front in acknowledging my three strikes against the film before even having watched it. First, it was another zombie movie; I love them, but it seems we’re drowning in an undead pop cultural glut right now, with so much easy, bad media that it’s easy to forget the good stuff. From comics to movies to punk bands who take the stage with half-eaten-face makeup, I often find myself wishing this sub-genre would take a powerful shotgun blast to the face (a double-tap, in fact, for good measure). My second trepidation was Bill Moseley; I’ve been doing a lot of homework in preparation for the Crypticon Celebrity Dinner, and while I generally like Bill Moseley’s performances, he tends to be the best thing about the movies in which he appears (Repo! The Genetic Opera has the distinction of being one of The Worst Movies I’ve Ever Seen). Strike three: Dead Air went direct to DVD; not a confidence booster. Fortunately, none of these strikes mattered by film’s end. 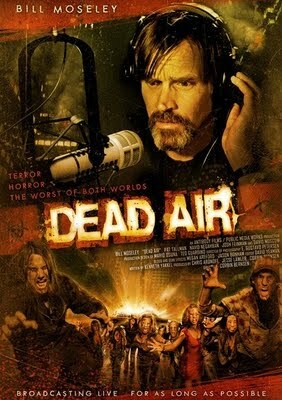 A giddy mash-up of Talk Radio, 28 Days Later, and the television show 24, Dead Air is the story of late-night L.A. shock jock Logan Bernhardt (Moseley) who has the misfortune of being on the air during the zombie apocalypse. The film opens with a group of terrorists planting toxic canisters in the air ducts of a sports arena; as with any bona fide zombie picture, something goes wrong and the canisters are prematurely opened, gassing not only the intended target but also the terrorists. The victims experience a sickness that builds into feral rage, which keeps their bodies animated and hungry even after death. Many in the panicked populace call in to Logan’s radio show, the only one in town that hasn’t switched to the Emergency Broadcast System. This movie has a number of things going for it. The first being that it partially updates Oliver Stone’s Talk Radio for the modern age; both films featured broken men talking about paranoia to a broken audience in uncertain times. Eric Bogosian’s performance is a tough to beat, but Moseley brings a nice interpretation to the archetype. He’s a laid back version of the ratings-mad conspiracy junky, his energy is more curious than accusatory. Another thing I like about Dead Air is that it doesn’t focus on gore effects; too many zombie stories are excuses to show people getting ripped apart in ways that out-splatter previous attempts, but Corbin Bernsen rightly ignores the rubbernecker impulse and keeps things moving. It was more shocking to me, a jaded film watcher, to not see gratuitous evisceration. I don’t want to put this movie over too much; it’s not perfect. My main gripe is that I wish it had maintained the intimacy of its premise. We leave the studio too often, following Logan’s radio sidekick (David Moscow) as he races through town on a motorbike in search of Logan’s family. There’s also a lot of unnecessary business involving the terrorists, with Delta Force-level dialogue about honor and sacrifice. There’s a nice development where the main perpetrator breaks into Logan’s studio and demands that the DJ say something unconscionable on the air, but that’s a faint glimmer in an otherwise very broad characterization. Had Dead Air been a bit ballsier and hedged closer to the one-act play feel of Talk Radio, it might have been truly special instead of a pleasantly engaging novelty; it’s much more interesting to hear the callers go from gabbing about nothing to reaching out to the lone voice in the night who can offer comfort at the end of the world than it is to watch another monster home invasion scene. I highly recommend Dead Air for fans of the genre that are looking for a fresh take. I’ve spent a good deal of time comparing this to other films, but it becomes unique by combining the best elements of those movies in ways you may not expect. Like Quentin Tarantino’s look into the world of hit men’s off-hours in Pulp Fiction, Dead Air answers questions about how people in the media might react to an undead uprising; it’s the flip side of the typical zombie movie trope where people are holed up in a house, trying to get news on the attacks, and believing that whoever is broadcasting it is in a safer place than they are. Note: Over dinner last night, I asked Bill Moseley about Dead Air’s origins, and he shared a fascinating bit of trivia regarding casting. His friend, Reggie Bannister (Phantasm), referred him to the project, and Moseley initially read for the role of Gil, the DJ sidekick. Corbin Bernsen, the director, was slated to play Logan Bernhardt, but the producers thought that having a name genre actor as the star would be a much savvier move than giving the part to someone whose biggest horror credit was The Dentist. This apparently caused some tension on the set, but Moseley said he channeled that energy into his performance. It worked.